The International Real Property Foundation (IRPF) has been a valuable and productive member of IHC Global’s coalition for many years. The foundation was created by the US Agency for International Development (USAID) and the National Association of Realtors (NAR) in 1992 after the fall of the Communist system, to help create viable private property markets anchored in providing equitable property rights to all citizens. Since its inception, the nonprofit has been committed to providing services to help organize real estate markets all over the world. Their work spans decades and involves countries across every continent. Most of their work in the beginning centered on creating real estate markets in Eastern and Central Europe, and they continue to have a strong relationship with associations there. Their programs in Europe included offering back-office technical assistance to help strengthen the organizations, helping with the drafting of real estate laws, and preparing real estate training, including creating a code of ethics and agency of representation. In Serbia, they helped prepare planning documents for the first real estate conference in the country, and in Romania they did significant work with multiple listing services, a way of aggregating data on houses sold. Outside of Eastern and Southern Europe, the IRPF helped provide information to real estate associations in Grenada, aided in reforming real estate licensing law in Ghana, and led vocational and real estate training programs in South Africa and India. Currently, the IRPF has a project in Uganda that focuses on women’s access to the real estate industry. They help organize conferences and training programs to share information about the importance of having secure property rights for all women. Their work is aided by their strong relationship with the Association of Real Estate Agents Uganda (AREA-U), and they work closely with the Women’s Council of AREA-U to create programs and help them secure local funding. But their most exciting work has been their part in creating the International Property Markets Scorecard, a tool pioneered by Dr. Richard Green, director of the USC Lusk Center for Real Estate, designed to streamline assessment tools that could be practical and useful to users. The tool gathers information from 54 different indexes and maps out the development level of various components of the institutions that make up real estate markets. 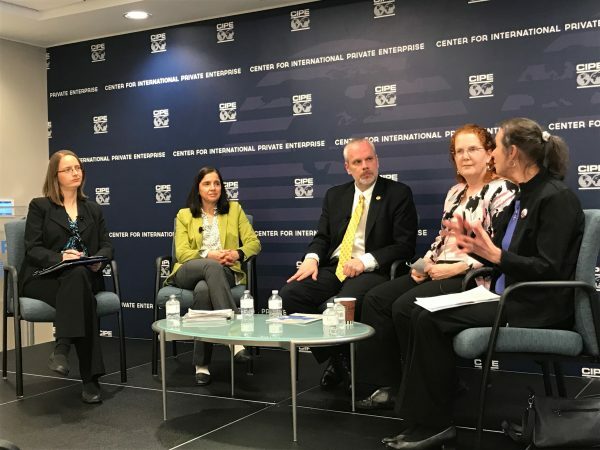 In collaboration with the Center for International Private Enterprise (CIPE), the IRPF presented the tool at the World Bank Land and Poverty Conference last week, citing studies in the Philippines, China, Armenia and Kenya. With proper funding, they would like to expand the use of the scorecard to other regional property markets. This scorecard comes at an ideal time, when there is a demand for better data and tools that respond to a specific country’s need. IRPF will continue their work in Eastern and Southern Europe, but would like to expand their training programs to Sub-Saharan Africa as well. Their main goal right now is to expand their program in Cuba, where the real estate market has just been opened up. They have developed a curriculum that they would like to translate and give to the Loyola Center so they can provide training for Cuban people who want to become real estate practitioners, and show what the new profession entails. The IRPF will also continue supporting the implementation of the New Urban Agenda, especially its clauses that call for organizations that deal with titling, property rights and appraisal to comply with legal regulations. For the IRPF, the New Urban Agenda represents a chance to reinforce transparency in real estate markets and bring trained and ethical real estate professionals onto the scene. The International Real Property Foundation occupies an important space in urban development. Fair and equitable property markets, in which all citizens are able to acquire assets, are invaluable to creating a prosperous society. In the United States and developed countries, a significant portion of GDPs have to do with the housing market. The ability that real estate markets have to turn housing into a liquid asset lifts the whole economy, and fair and transparent data lead to an equitable system. But above all, the IRPF sees the right to housing and secure tenure as a human right to which all people should have access.